I thank the Association of Young Filipino-Chinese Entrepreneurs (formerly Anvil Club) as well as the Federation of Indian Chambers of Commerce for inviting me to give a talk about “Defending Your Turf” recently. The topic on defensive marketing has attracted a bit of attention as of late, especially among those with successful businesses. This type of marketing is different from marketing for growth, which may be either market-driven (marketing to the served market) or market-driving (marketing to the underserved and unserved market). There are, after all, many branches of marketing strategies. Every time a profitable growing business is made, you can be sure that competition will be attracted to join the industry sooner rather than later. Since corporate performance is usually relative and seldom absolute compared to competitive moves, success will be affected by what key competition will do or is unable to do. This is why businessmen and marketers must also learn to view marketing from a defensive lens. They must know if counterattacks are needed. They must predict how new entrants and competition will steal their market shares and must also discover ways competition can be stopped from hurting their sales, profit and brand equity even before entering the market (known as competitive deterrence). Businessmen and marketers need to recognize that even good and innovating products can fail if not defended effectively, so they need to improve odds in their favor. Questions like "How can I anticipate competitive moves? ", "How can I push back competitive attacks and strengthen my business and brand?" are some questions that will keep them awake at night. Ford innovated in the automotive industry by introducing the Model T. Borrowing the assembly line concept, they were able to redistribute work within their factory and speed up production. Due to specialization, the resulting lower cost led to much lower prices, which expanded the market of users. Economies of scale further allowed them to lower prices periodically until it came nearer to the US$400 price tag of horse-drawn carriages then, making the latter extinct as a mode of transportation. Ford dominated the automotive industry for years until GM decided to introduce cars with different colors to exploit an unmet need then, as Ford cars were only in black. Remember the popular quote from Henry Ford, “You can have any color so long as it’s black?” It was about protecting their economies of scale model. By the time Ford decided to introduce colored cars, it was already too late. GM already took over the market and Ford already lost their economies of scale. Firms often resort to mergers and acquisitions as an accelerated way to grow, gain or maintain market shares. In the Philippines, giant retailers like SM and Puregold have not just been expanding by building more branches but have also acquired relatively smaller competition. In the case of SM, it acquired majority shares of Waltermart in 2013 after Puregold acquired Parco and S&R earlier. In the fast food industry, Jollibee acquired 2/3 of Mang Inasal, as well as Chowking and Greenwich, among others. With the right marketing mix and execution plan, thought leadership will eventually lead to market leadership, as shown in the above industry dynamics of the retail and fast food industry. In the take-out cooked chicken category, Chooks-To-Go has already taken over market leadership from Andok’s in less than 3 years. In the airline industry, Cebu Pacific Air is now leader not just in the low cost carrier category but also in overall domestic air travel. In the drug store category long dominated by giant Mercury Drug, credible upstarts like The Generics Pharmacy have conquered the generics category. Marketing case histories have taught us patterns of new entrants introducing a product in a niche, which incumbent market leaders have many times ignored. After all, market leaders have other strengths to rely on for their growth objective. It is this indifference that becomes the critical period when niche players can build their critical mass. Eventually, successful new entrants will no longer be satisfied with a niche and would use the gains in their original market to enter adjacent markets. A review of the strategies used by Canon in photocopiers and Enterprise rent-a-car in the USA would prove my point on how leaders can lose their leadership advantage. 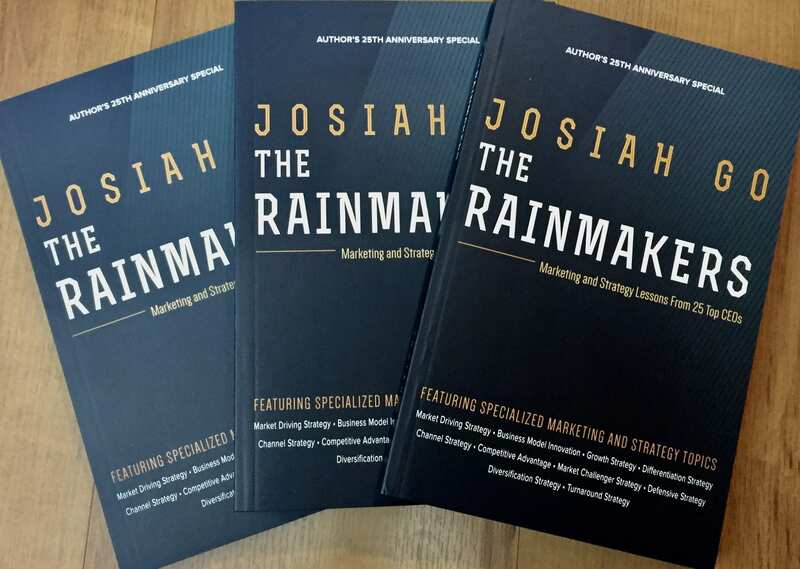 JOSIAH GO is the Chairman and Chief Marketing Strategist of Mansmith and Fielders Inc., the market leader in marketing, sales and innovation training in the Philippines. Mansmith also has the widest curriculum in Asia Pacific. Follow Mr. Go’s daily twitter marketing tips at @josiahgo.